Llamas are found in the highest parts of South America, where they are known as the Truck of the Andes, for their ability to walk long distances and carry goods. And the good news is that you can go llama trekking in the UK - a VERY different way to get active, get walking, enjoy the countryside & beautiful scenery, breathe in fresh air, blow away those cobwebs & have fun with new friends. When you're planning a walk with a llama, please check before you buy to see what the booking procedure is on each of the web sites, and do check locations, T&Cs, and things such as fitness requirements, minimum ages etc. Activity Superstore have a great gift experience for animal lovers and anyone who loves llamas! 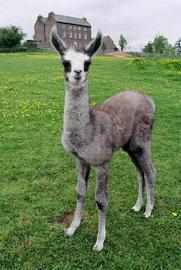 Take a llama for his her daily walk in East Sussex! You'll get to know the llamas first, and have instruction on how to handle the llamas. Then it's off through the beautiful Ashdown Forest, leading your own llama and stopping en route as your llama nibbles favourite leaves and the two of you enjoy the view. Afterwards you can enjoy the park for the rest of the day. There are up to 18 other people in a group. 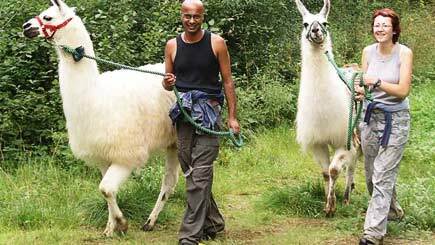 It's £69 for a Llama Walk for Two. Go to Activity Superstore to buy this experience and find out more. Lakeland Llama Treks "Feeling stressed? Get calmer with a llama," says the site, and there's a llama song to listen to as well. Cumbria is a stunning county and there'll be lots of beautiful scenery to enjoy as you go llama trekking and try some llama wine! Dartmoor Llama Walks offer taster sessions to help you get acquainted with llamas. These give you the chance to meet and greet them, groom them, take them for a short walk, and let them back into their field. Llama walks give you an opportunity to enjoy the magnificent surrounding scenery. Water Town Llamas in North Devon have gentle llama treks (by appointment) and they provide a great opportunity to enjoy rural views and find out more about llamas. They include an introduction to keeping llamas, with lots of hands-on experience - their llamas love a brush - and a guided tour led by Monalisa, Bajanga and their friends! Find out more about the treks here. UK Llamas offer a range of activities, including Learn with Llamas, a hands-on experience, kids' birthday parties, treks and fund-raising; they offer a range of treks to suit your needs through the stunning Dorset countryside - just take a look at their beautiful photos! Severnwye Llama Trekking Go trekking in the beautiful Forest of Dean with Severnwye Llama Trekking. Many of their animals are available for shows, weddings and other events to really give you a theme with a difference! The farm welcomes educational groups. Old King Street Farm Half day or one day treks, and whatever you do, visit the site and read A llama writes and the archives. The farm has a number of holiday cottages so you can head into the fresh air and really blow the cobwebs away. Catanger Llama Trekking As well as llama treks, Catanger offer corporate and private trekking, so if you're looking for a special occasion to do some team building with a difference, why not get in touch with them? National Forest Llama Treks Looking for a different theme for your children's birthday parties? Look no further! National Forest Llama Treks can offer the kids a really memorable time, when they spend an hour with a llama, grooming, taking him or her for a walk, and feeding them - and then it's games time! The site has great llama jigsaws and games on it. Surrey Hills Llamas Take a walk through the Surrey hills with a llama. In fact, why not adopt a llama for someone special? Ashdown Forest Llama Park with special events on around the year, including llamas being sheared. There's a gift shop, a coffee shop, and conference facilities. Go see those llamas! Bluecaps Llamas Trekking, (starting from a leisurely 40 minutes), pub walks, llamas and alpacas for sale, plus a great range of halters and accessories and knitwear! Bluecaps can provide treks for corporate entertainment and team-building - just get in touch with them to find out more! Nidderdale Llamas near Harrogate have 5 different options for trekking, including 20 minute walks & full day picnic treks, and they also offer hen parties, children's parties and corporate team building days. 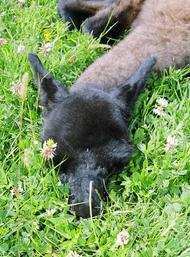 You can adopt a llama and Nidderdale Llamas also offer educational packages, covering subjects such as South America & the history of Camelids. There are also other animals to make friends with, including ponies, rabbits, guinea pigs, ferrets & birds! If you know of any other venues offering llama trekking or walks, please tell us about it.